Daniel Yuan, Kevin Qian, and Timothy Qian swept first, second, and third place in the 2018 University of Maryland Mathematics Competition. They each will receive a scholarship for full tuition and expenses if they attend the University of Maryland. 15 other Blair students won Honorable Mention. The Math Team won first place at the 2018 Princeton University Math Competition (Instagram). Steven Qu won 3rd place in the American Mathematical Society's 2019 Who Wants to Be a Mathematician Championship. Ian Rackow, Sophia Weng, and Shawn Zhao won the 2018 Georgetown Fall Invitational (@BlairQuizBowl). Chris Tong, Sophia Weng, and Shawn Zhao won the 2018 Centennial Invitational (Silver Chips). 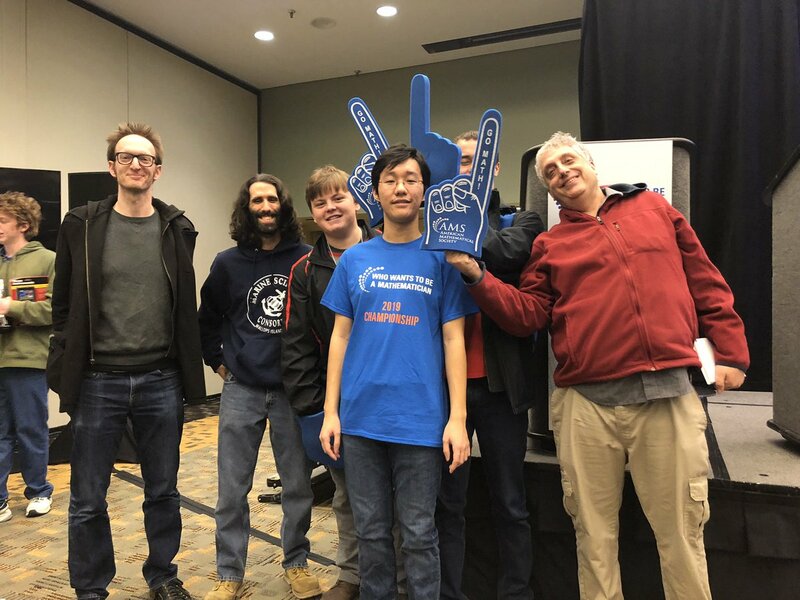 Martin Brandenburg, Albert Ho, Jason Liu, and Leela Mehta-Harwitz won the 2018 Thomas Jefferson Novice Invitational (@BlairQuizBowl). Justin Haddad is a nationally ranked fencer who recently won a gold medal at an international under-17 fencing competition in Austria (Bethesda Magazine) (Silver Chips). Kevin Higgs, Ian Rackow, and William Wang won second place in the high school competition at NYU Tandon School of Engineering's 2018 Cybersecurity Awareness Week (@blairmagnet). Dhruv Pai, Marie Brodsky, and Suveena Sreenilayam were members of teams that won the 2018 Congressional App Challenge! Their apps are MCSSL-Helper and Time Flies. Several Blair magnet musicians were named to regional ensembles: Ryan Cho in the All-Eastern Orchestra (@MBHSmusic); Hannah Lee in the All-Eastern Honors Orchestra, and SeYong Park in the All-Eastern Honors Concert Band (@MBHSmusic); Audrey Li in the All-County Sr. Chorus, Dhruv Pai and Carsten Portner in the All-State Jr. Chorus, and Eve Kuo in the All-State Sr. Chorus (@MBHSmusic); Hannah Zhang in the All-State Jr. All-Orchestra and Justin Hung in the All-State Sr. Orchestra (@MBHSmusic); and many others in regional, state, and county honors ensembles (@MBHSmusic). The Science Bowl team finished in second place at the Maryland Science Bowl (@MrPham_at_MBHS). Mr. Stein's Political Statistics Class was recognized for its mathematical model of the 2018 midterm elections (MCPS) (Silver Chips) (Bethesda Magazine). Magnet Arts Night was held on January 18, 2019 (Silver Chips). Ms. Hart won the 2019 Schubert Award from the Chemical Society of Washington, recognizing her as an outstanding teacher of high school chemistry.